#StainAlive! The Center for the History of Print and Digital Culture’s Postdoctoral Fellow Heather Wacha and two colleagues – Dr. Erin Connelly (University of Pennsylvania, Schoenberg Institute for Manuscript Studies) and Dr. Alberto Campagnolo (Library of Congress) – have recently received a CLIR/Mellon microgrant to undertake a project that will create a “Library of Stains” for scholars, librarians and conservators. 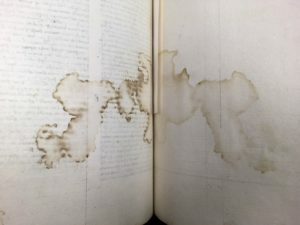 If you have ever spilled coffee or left a stain on a book you were reading, then you will understand how accidental human interventions leave all sorts of traces in and on books. M edieval people were no different; they too accidentally left stains on their reading material. Historians of the book often see stains as inconveniences at best, and tragedies at worst. 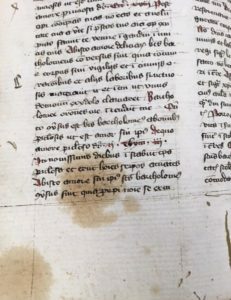 The Library of Stains project will examine a variety of stains found on parchment, paper, and bindings from medieval manuscripts, focusing only on “dirty” old books in order to gather scientific data that will provide clues as to how previous generations used and stored their reading material. The data will provide a new approach for learning about the history of the book, the materiality of books and book conservation. Using multi-spectral imaging techniques, the team will photograph a diverse array of stains found in medieval manuscripts, including these manuscripts held at the University of Wisconsin Special Collections! Image analysis will generate a dataset of characterized stains commonly found in manuscripts and the dataset will be made available to a broad audience through an open source digital repository. 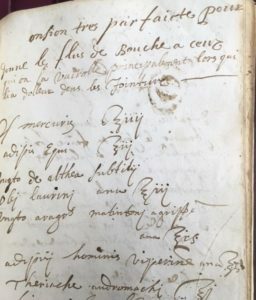 The team members hope that this new tool will help scholars advance techniques for analyzing manuscripts vis à vis provenance, use, transmission, preservation and materiality. Stains – and the “boring” books they are often found in – can be as enticing as the beautiful illuminations more commonly associated with medieval manuscripts. Be on the look out for regular social media posts and blogs as the project progresses. Follow us on Facebook at Labeculae Vivae -Stains Alive, Twitter @labeculaevivae and Instagram as Labeculae Vivae and keep an eye out for #StainAlive, which hopes to engage the public in the intimate connection between readers and what they read.